This is the age of scooters in India and the manufacturers have now started looking beyond the traditional 100-110 cc good-for-all family scooters. 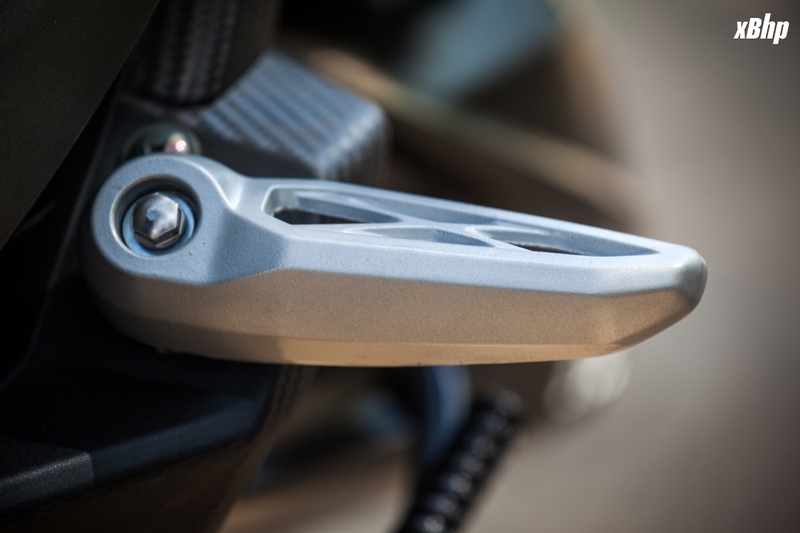 New segments are being explored and new products are being designed to match the aspirations of this growing market. 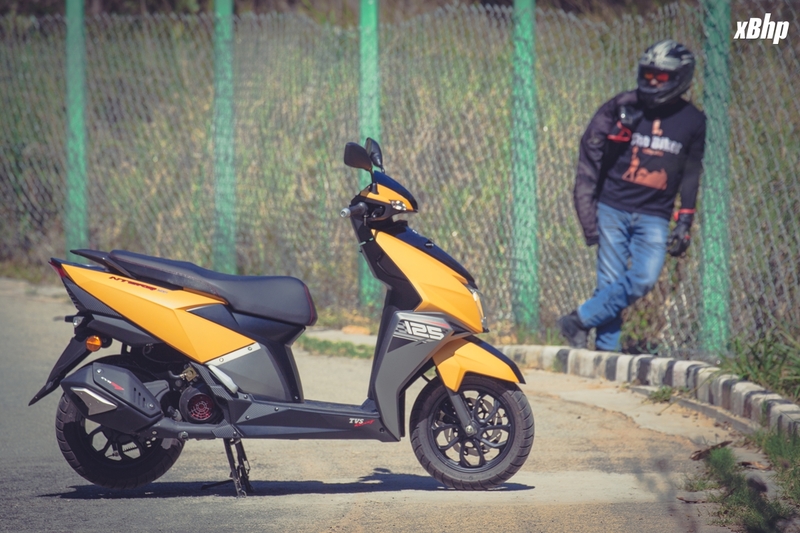 Latest player in this competition is the TVS NTORQ 125, which was launched just a couple of days before the Auto Expo 2018 at a price tag of INR 58,750 ex-showroom Delhi. We were told that we will get to ride this scooter right after the Auto Expo and indeed we rode it yesterday at TVS plant in Hosur. 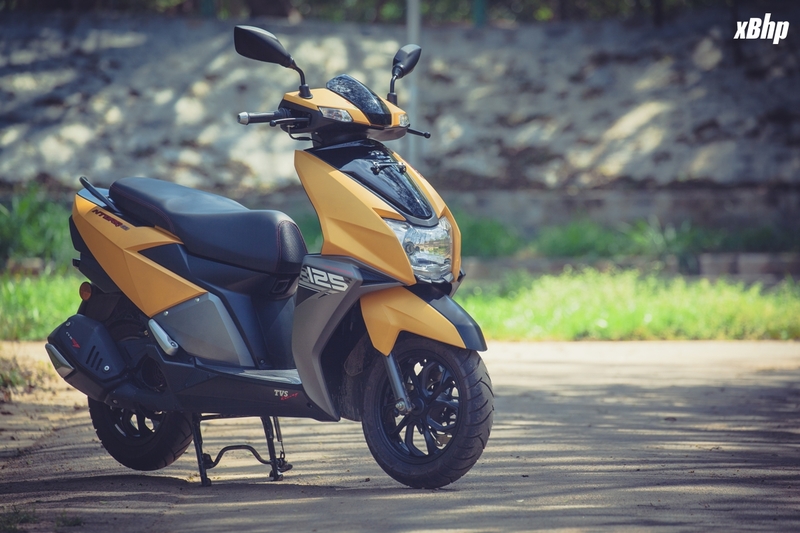 The TVS NTORQ 125 is clearly aimed at the younger generation, the urban/semi-urban youth, for whom styling takes priority over a lot of other things. 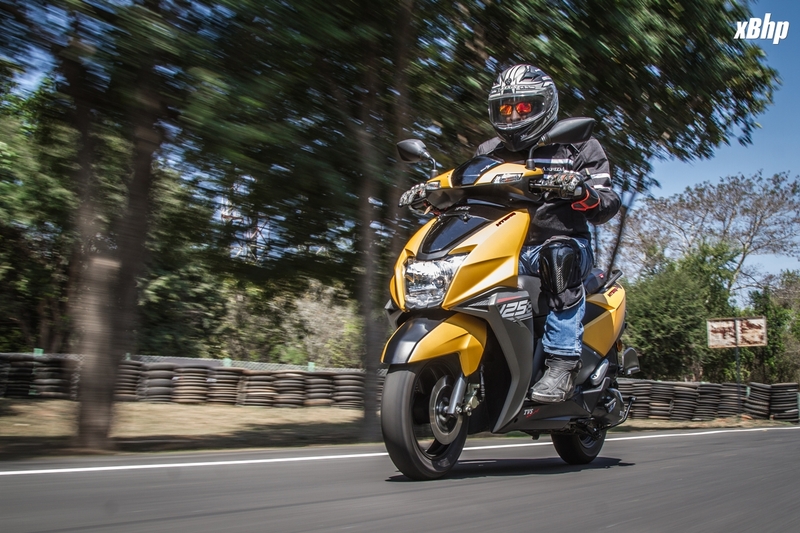 To that end, the NTORQ 125 has been given quite aggressive styling with sharp lines and angles. The design of this scooter, TVS said during the launch, is inspired by a stealth fighter aircraft. And indeed, there are afterburner-like vents at the tail, which look interesting if nothing else. 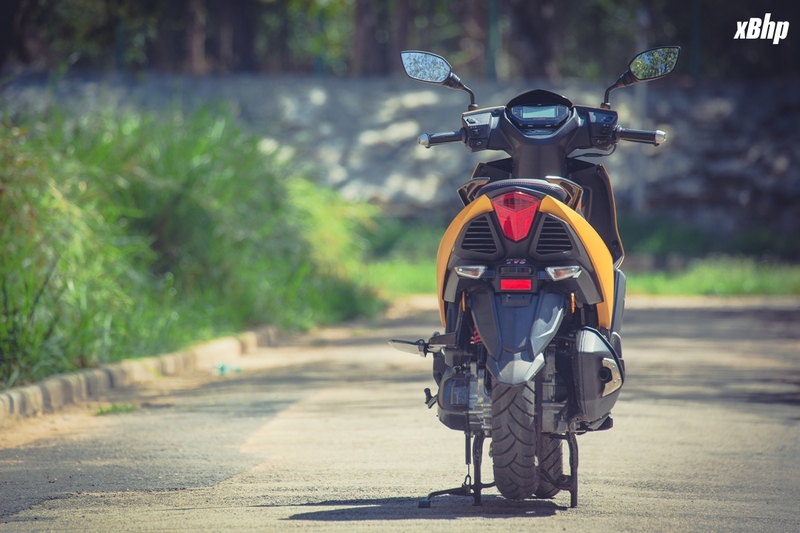 Talking about the tail, I must say that the NTORQ 125 has one of the most stylish tail in the Indian 2-wheeler market currently and the credit for the same goes to its LED tail lamp. 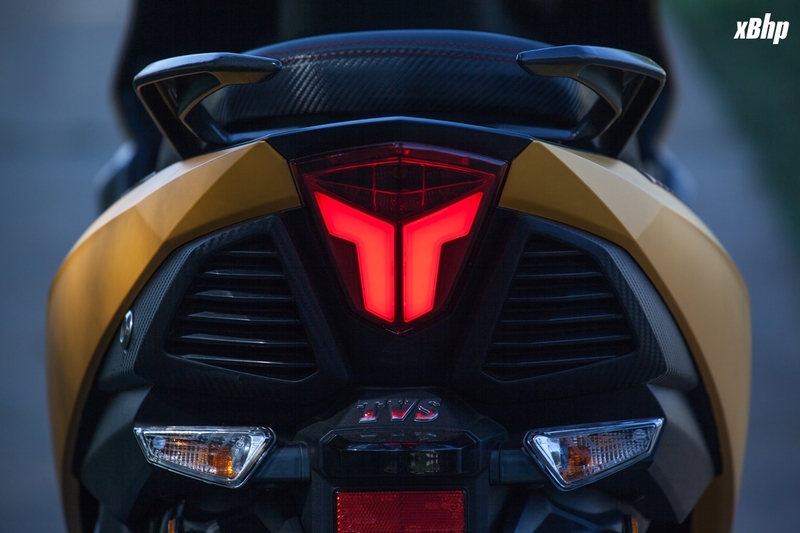 That also brings us to the triangle shaped headlight, which we wish was LED too to keep up with the overall design philosophy of this scooter. Anyways, there is an LED DRL. What grabs your attention apart from the things mentioned above and the overall neat and clean design, without unnecessary use of decals, is that beefy exhaust which sounds reasonably good as well. 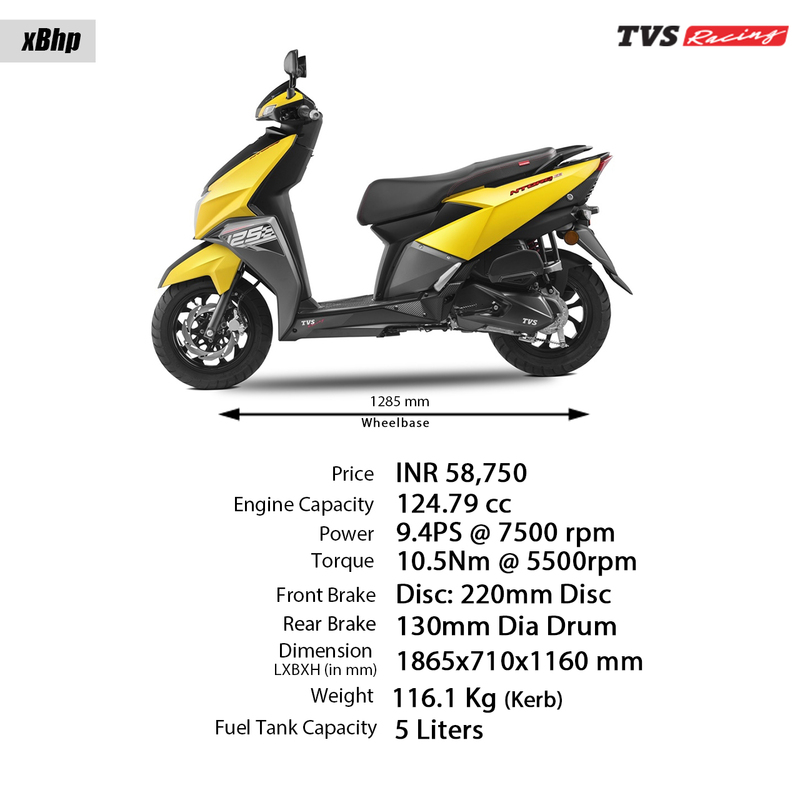 Full marks to TVS designing team for their attention to details on this scooter, be it the copious use of carbon fiber finish on the plastic panels, contrasting stitch on the seat, the chunky looking split grab grails, textured floor board, or the bigger 12 inch tyres with alloy wheels to enhance its appeal. Other key features include an engine kill switch and an external fuel filler cap. Though it would've been preferable if you could open that fuel cap from the ignition key slot itself. 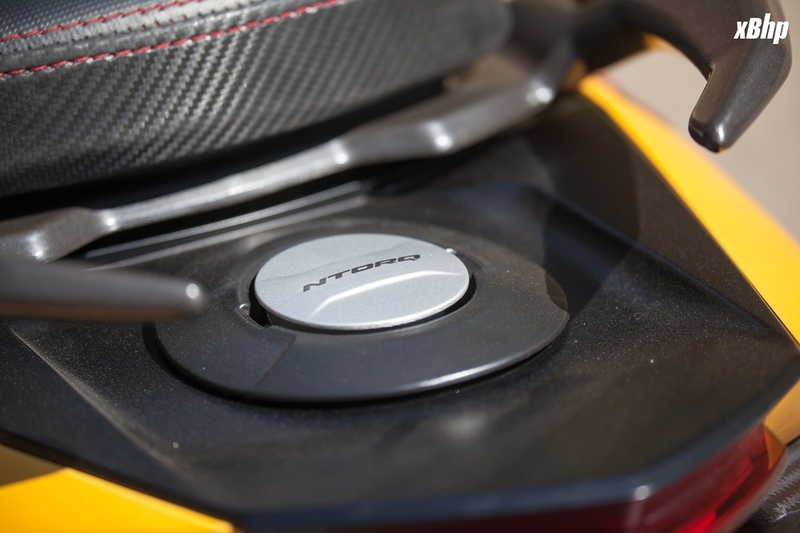 Currently, you will have to get off the scooter and put the key in the slot right under the tail of the scooter to release the fuel cap, which renders the external fuel cap quite useless in my opinion. 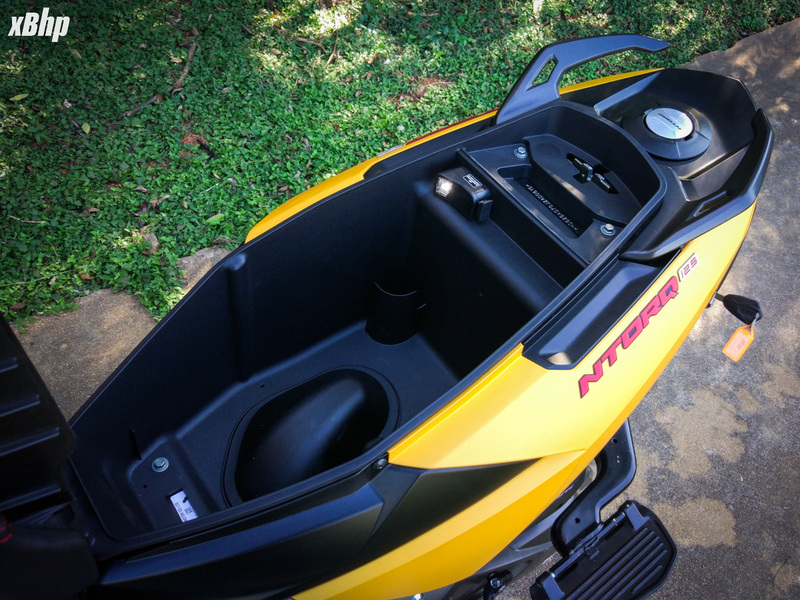 There is ample underseat storage, not big enough to hold a full size helmet though. Then there is an underseat light, pass light switch, and USB charger as well. Currently, there are 4 color options available - matte yellow, matte white, matte red, & matte green. 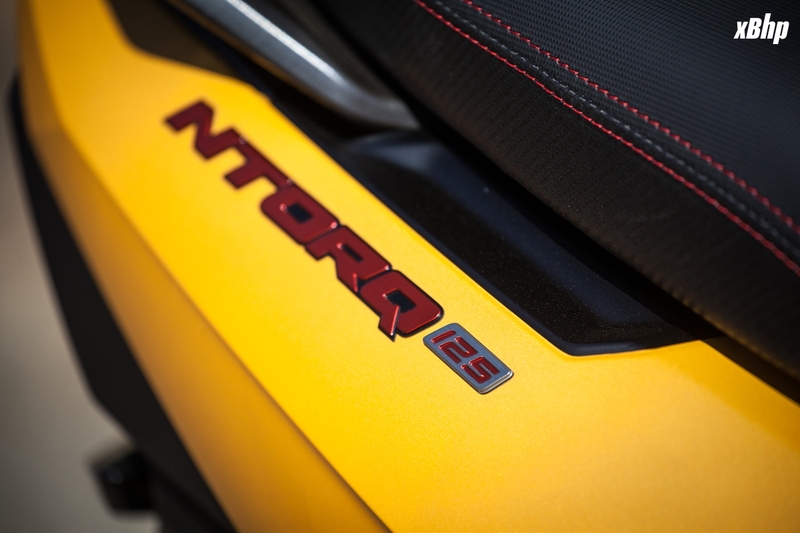 The TVS NTORQ is powered by an all-new 125-cc engine that makes 9.4 PS at 7500 RPM and a peak torque of 10.5 Nm at 5500 RPM. During the briefing before the test rides, TVS officials told us to keep in mind that this is a 'sporty machine' and not an out and out 'sports scooter' so we better keep our expectations realistic. 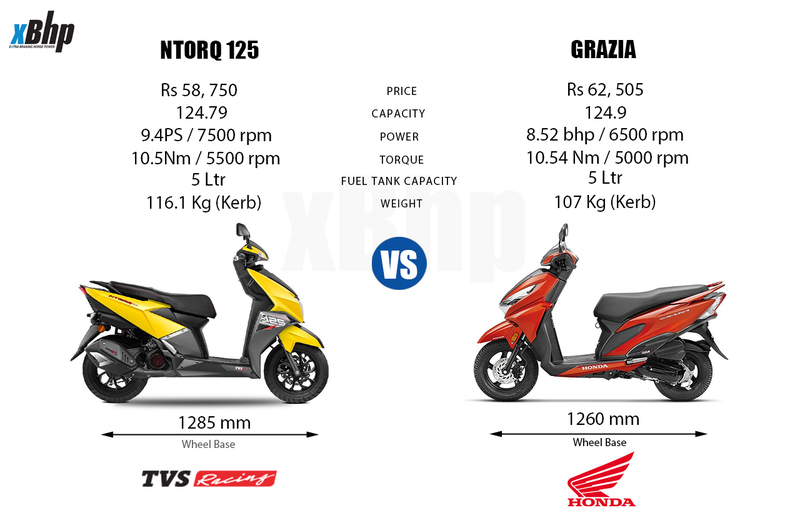 And true to their words, the NTORQ 125 does impress you with its performance, but doesn't really come out as a power-packed machine. 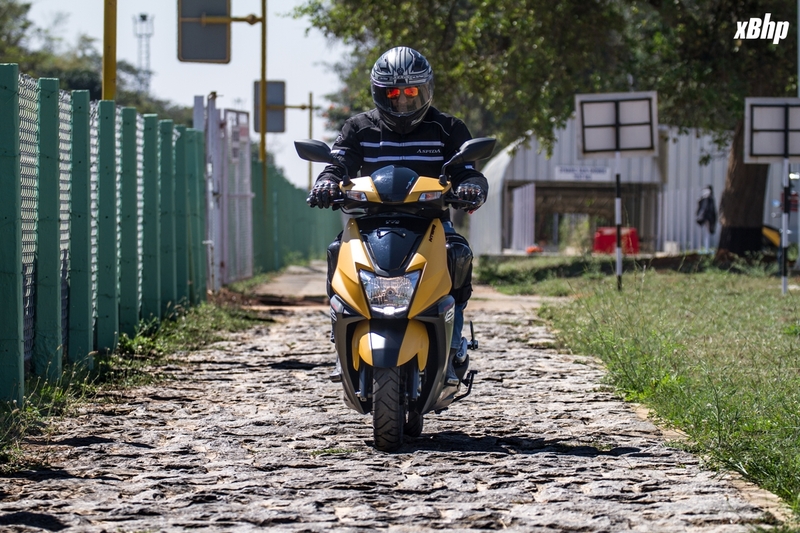 The engine was smooth and vibration free throughout and remained so when put under stress of riding in the high-rpm range for a number of laps at the TVS test track. 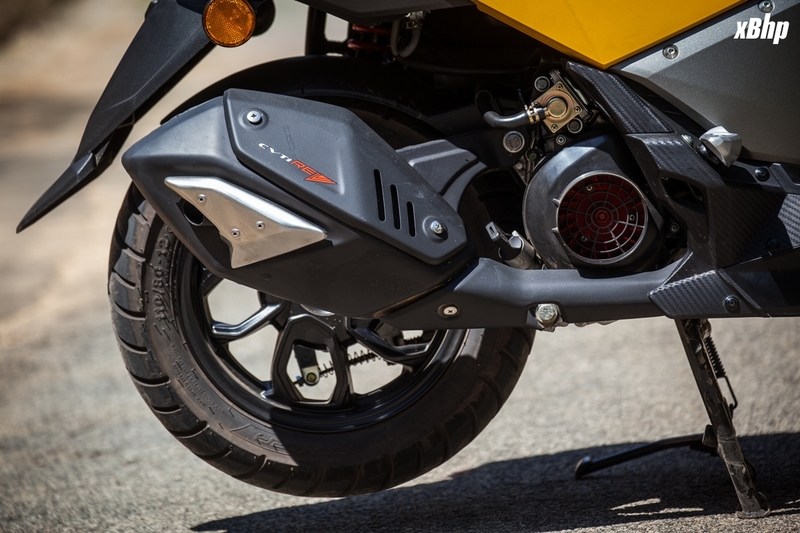 It has a solid low and mid range and does respond to throttle variations without much fuss. 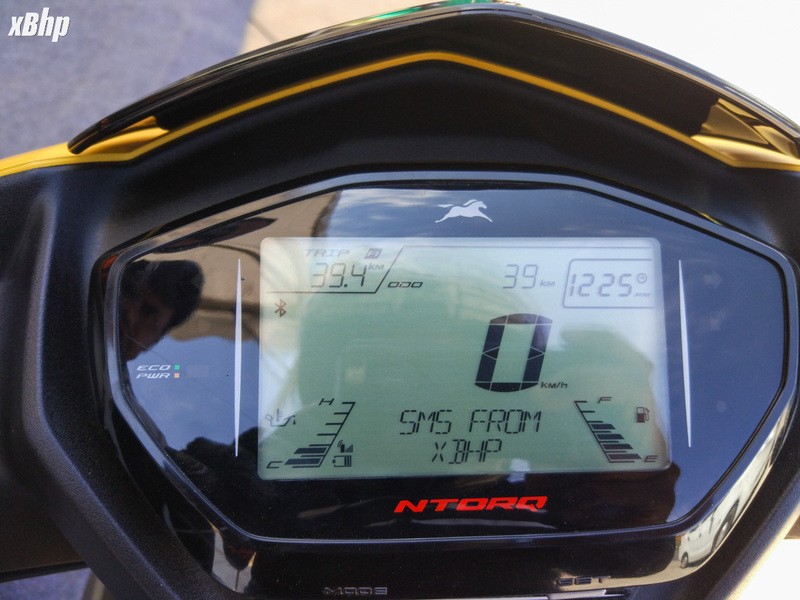 TVS officially claims a top speed of 95 kmph and I did manage to hit that mark repeatedly. Although there were a couple of journalists from other publications who managed to go 3-4 kmph higher than I could. 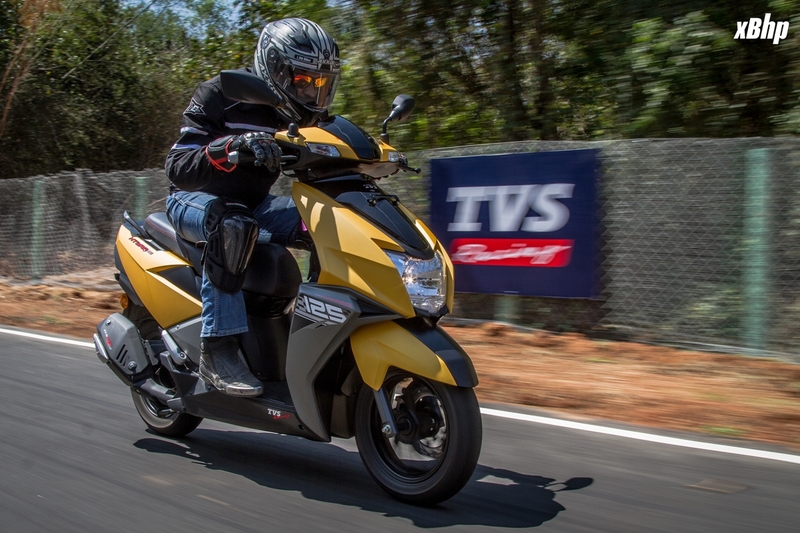 TVS hasn't revealed the official fuel economy figures but says that it will be at par with other 125 cc scooters in the market. 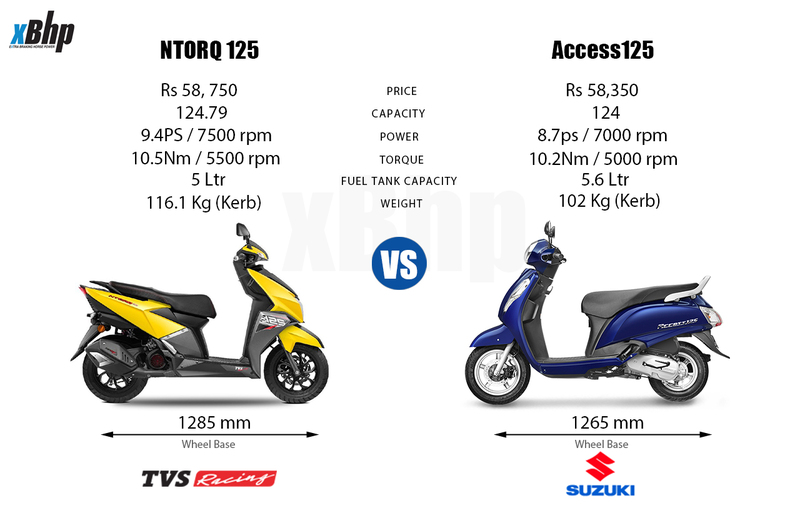 And, it is important to note that the NTORQ 125 is much heavier than the current market leader (Suzuki Access 125) in its segment. 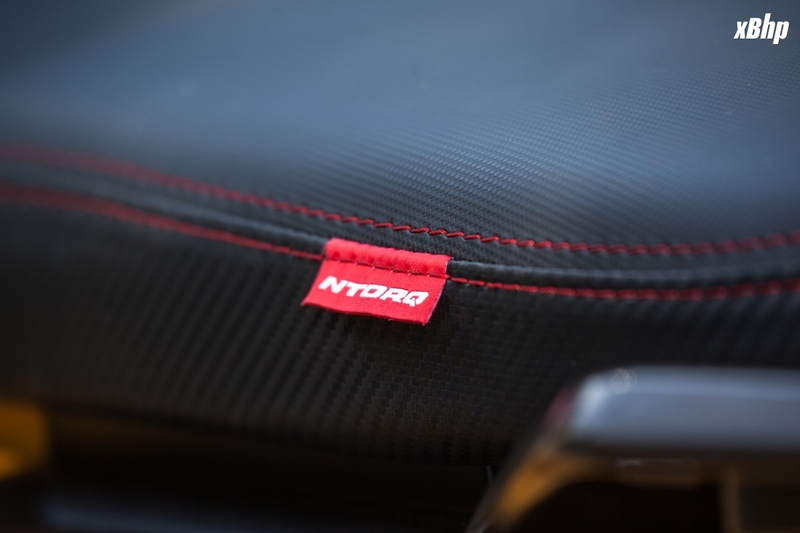 The Access weighs 102 kg while the NTORQ weighs around 116 kg. And that weight would have an impact on its performance as well as the fuel economy. 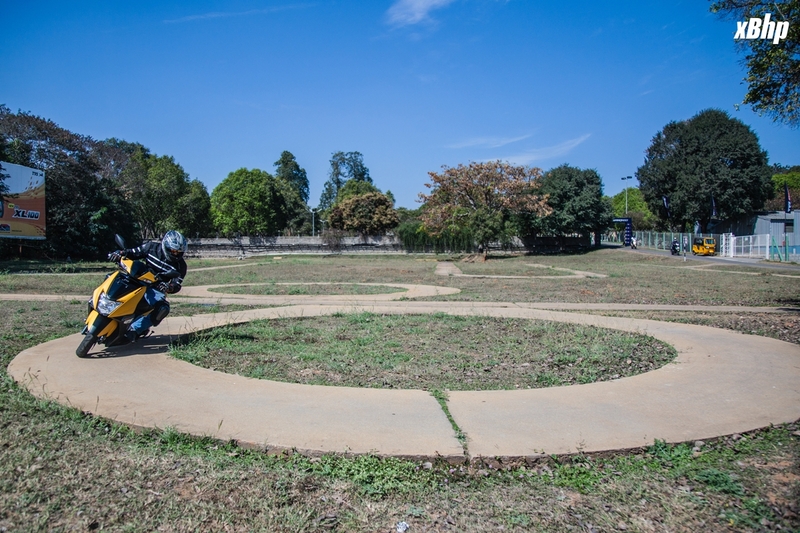 The chassis-suspension setup finds the fine balance between being too stiff and being too soft and inspires a lot of confidence in the corners without compromising much on the comfort front on the bumpy roads. The handlebar sits pretty high and the taller riders wouldn't find their knees hitting the handlebar. 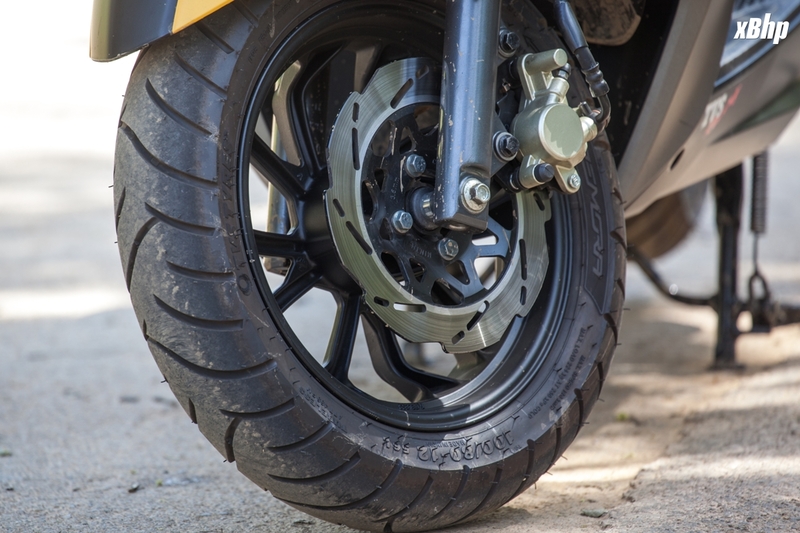 The NTORQ 125 is fitted with a 220 mm petal disc at the front and 130 mm drum at the rear, and it does impress with its braking capabilities. Though the rear tended to slide a bit under heavy braking. It is also fitted with 12 inch diamond cut alloys with 100/80 tyre at the front and 110/80 tyre at the rear. 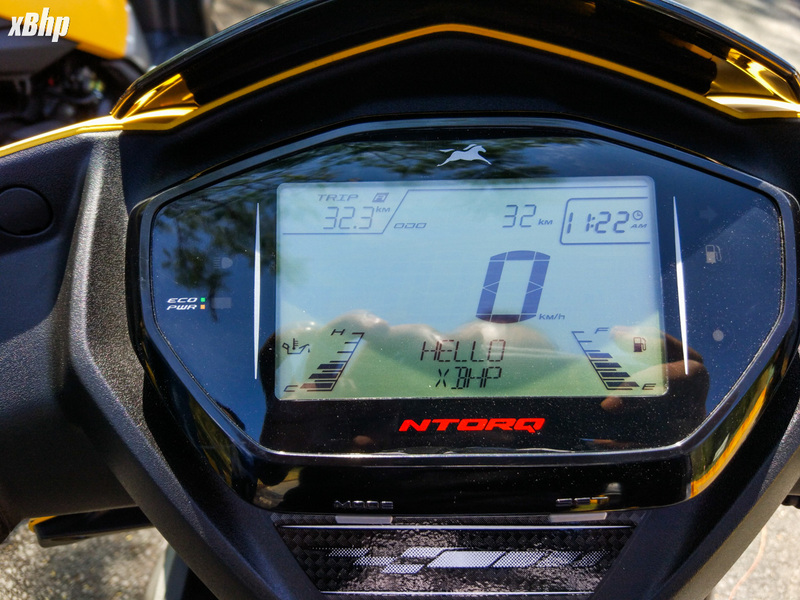 Now let’s talk about the instrument cluster, which is going to be the biggest talking point or the USP of the TVS NTORQ 125. 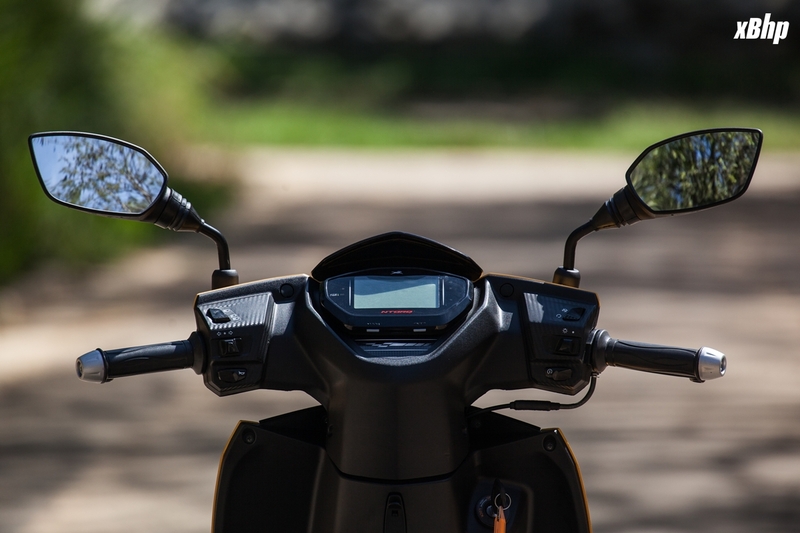 It is fitted with a fully digital instrument cluster that shows you a lot more information about your scooter and your ride than any other scooter in India would do currently. As per TVS, it records and shows 55 different statistics. Apart from the regular things like speed and two trip meters and the current time, it records your top speed achieved, your 0-60 timing (8.3 seconds being my best), and your engine temperature. 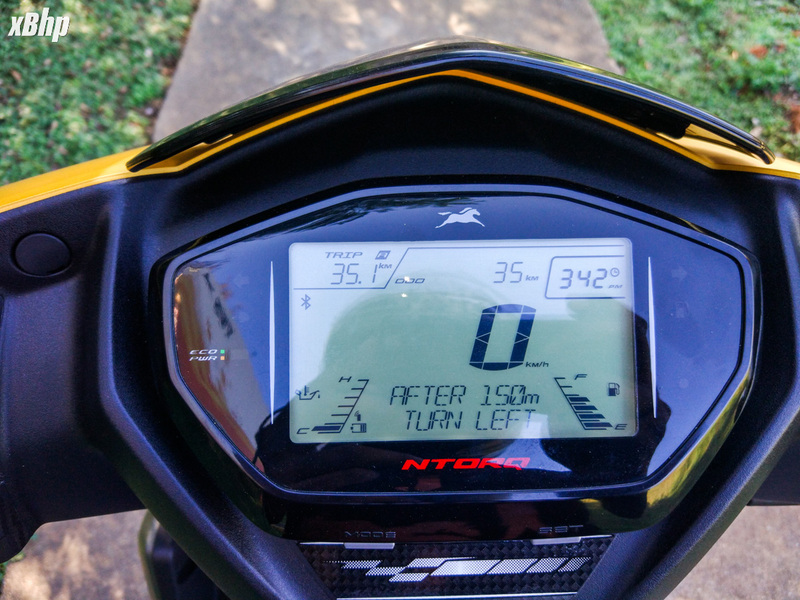 The instrument panel itself has two riding modes (street mode and sports mode) and records and displays different set of information in both riding modes. 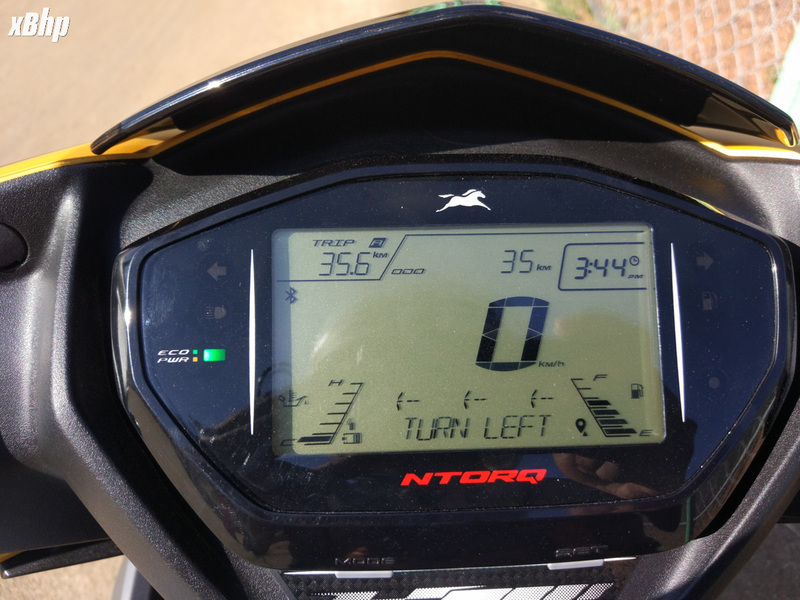 For example, when riding in sports mode, it would show your lap timing as well. Then there is a blinking helmet indicator that reminds you to wear the helmet when you turn on the ignition. Then there is a service reminder and a green/orange LED that tells you whether you are riding in economy mode or sports mode. And finally, you can connect your smartphone with the NTORQ 125 with the help of an app. 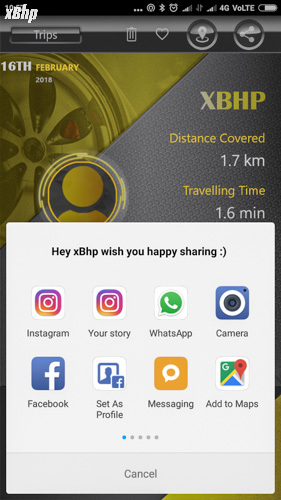 The app is currently available only for android phones and connects with the scooter via Bluetooth. 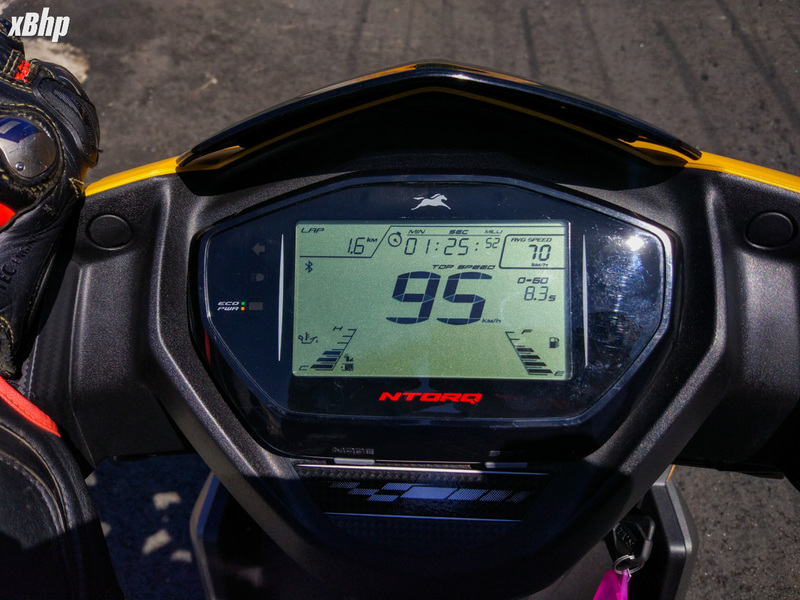 Apart from recording your ride statistics and saving your favorite route, it will also give you incoming call alerts and show the name of the caller on the display screen of the scooter. 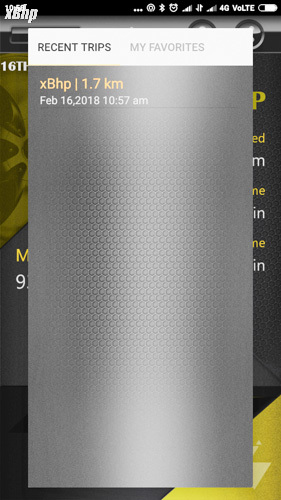 It will also show the incoming SMS alert and phone battery and signal level. 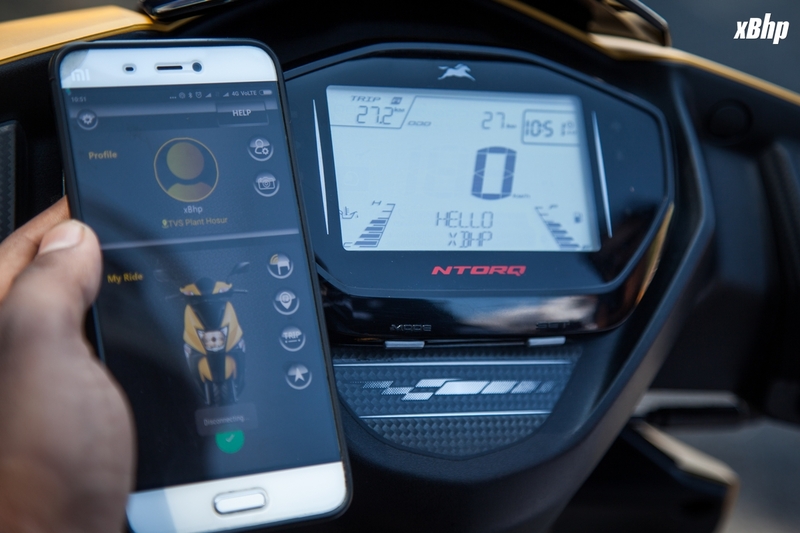 You can also set the app to send a customized message to anyone who calls you while you are riding. 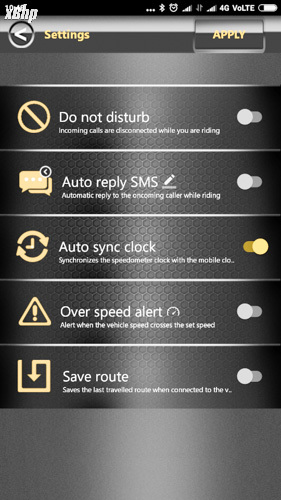 You can put the app to 'do not disturb' mode if you do not want scooter to show you any of these call/sms alerts while riding. It will also show you your last parking location on the map and can guide you to it if you forget where you last parked your scooter. You can share the above statistics with your friends/family from within the app itself. And the cherry on the cake is the turn by turn GPS navigation alerts, which you can get on the display console of the NTORQ 125. All you have to do is connect your phone with the scooter, fire up the NTORQ app, and feed your destination in the app and start riding. 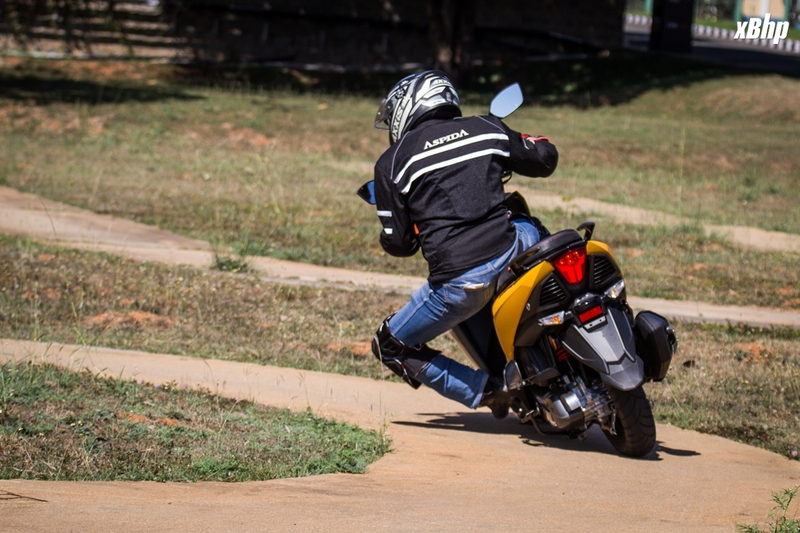 The scooter will take the input from your phone and display alerts with the help of arrows and text messages as your progress. It will also reroute automatically if you miss any turn or overshoot your destination. It will also show the estimated time of arrival and the remaining distance. 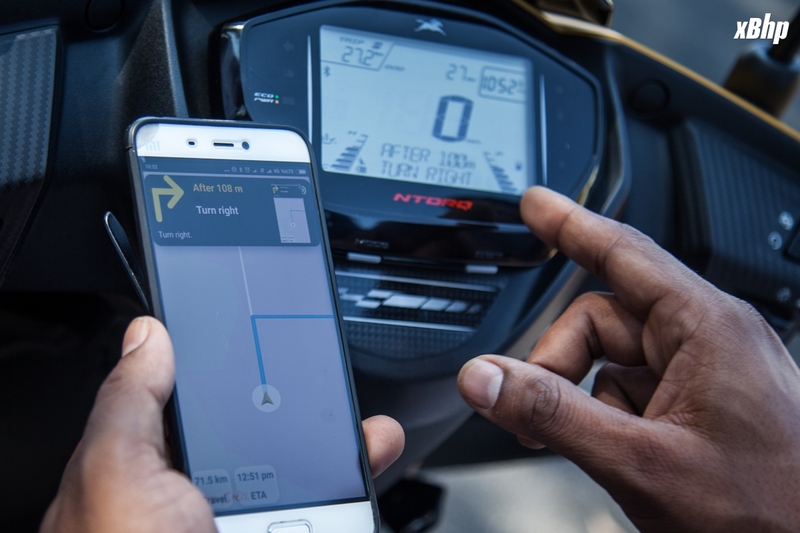 TVS has partnered with Map My India to enable the turn by turn GPS assist on this scooter. The maps are not loaded offline on your device and would need an active internet connection to work. While riding on the TVS test track, I found some of the above data shown by the app/digital console quite involving and fun; however, it is yet to be seen how the actual day to day user would utilize all that information, e.g., the engine temperature and the lap timing, etc. 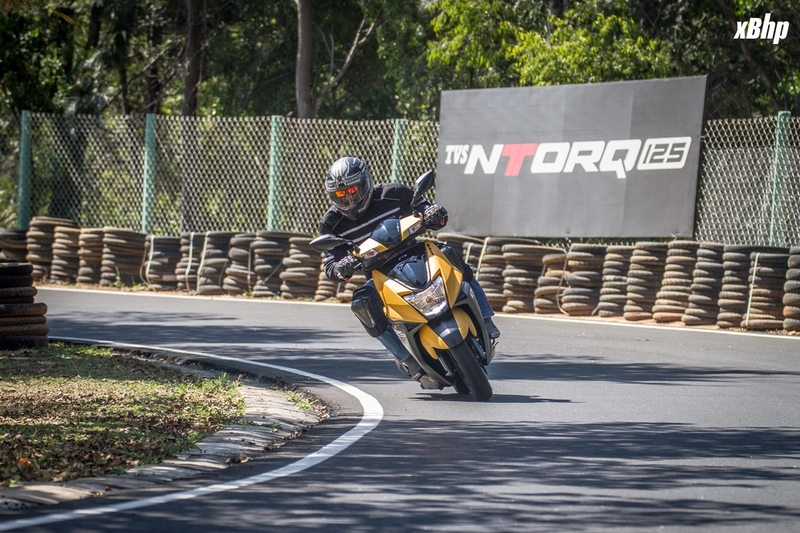 Overall, the TVS NTORQ 125 ticks all the right boxes for the targeted audience. 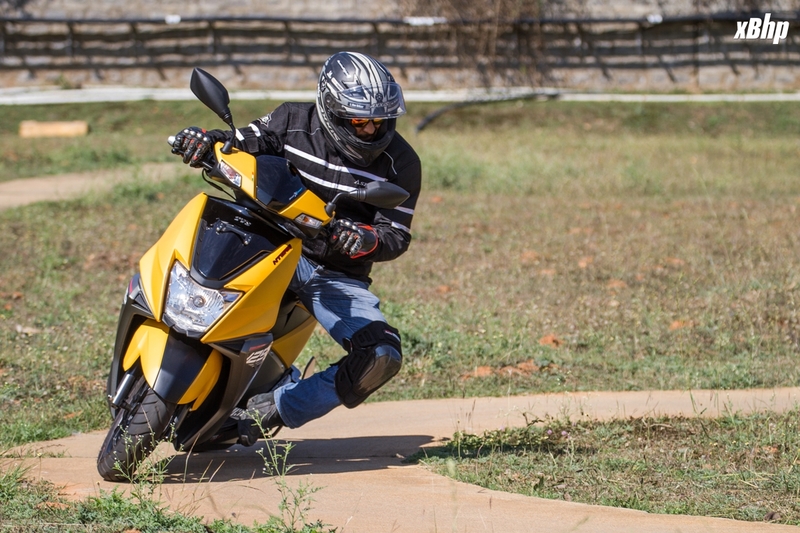 It is a scooter that is high on the styling front, but doesn't compromise on the practical aspect. The engine is smooth and has good low and mid range. It is reasonably powerful and is full of goodies & features that would attract a lot of youngsters. It can be used to make a style statement as well as to run errands. 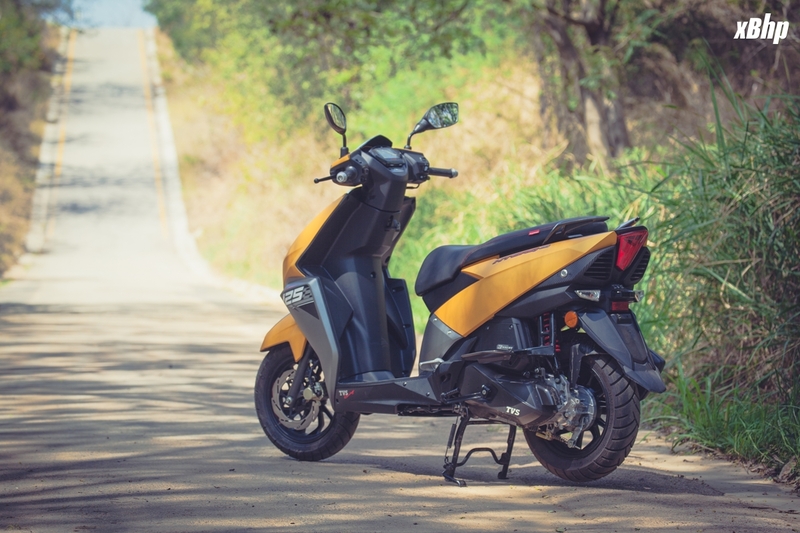 Priced at INR 58,750 ex-showroom Delhi, It is significantly cheaper than the Honda Grazia Disc version (62,505 INR ex-showroom Delhi) and only marginally expensive the market leader Suzuki Access (58,350 ex-showroom Delhi). 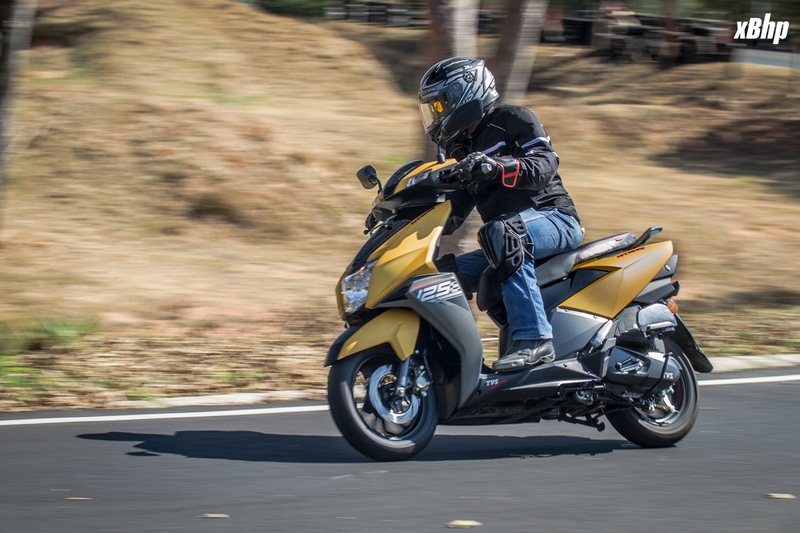 How the market responds to this scooter, only the time will tell us, but it will definitely force other manufacturers and upcoming competitors like Suzuki Burgman, Aprilia SR 125, Hero Maestro, & Hero Edge to step up their game. Last edited by sunilg; 03-06-2018 at 01:45 PM. Rony, ashwanth.r, keith_j_snyder2 and 5 others like this. Thank you Sunil for the superb review, snaps and comparisons! The scooter is really impressive, hope the display does not have issues like the KTM 390 which everyone is complaining about due to the gizmos. If possible could you give a comparison between the Jupiter and NTORQ? I understand the Jupiter is 110 vs the 125 cc of this new one, but, it would be interesting to know how far ahead the new one is. As always, a detailed and comprehensive review! superb review man just loved it! photography is also just on the point. 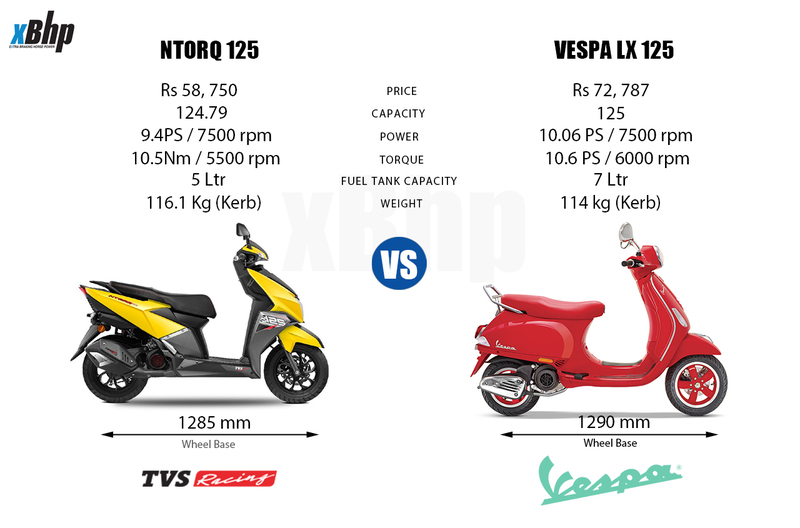 Waiting for the NTorq vs aprilia sr 125 review.....would be even more pleasureable if grazia/ access 125/ vespa lx 125/ all get added to the comparo! Parth, what is the need for quoting such a long post to reply??? Please don't do that in future. Excellent Review . NTORQ's fit & finish, build looks to be top notch. Lots of electronic wizardry for the price and TVS definitely know the pulse of the current generation. Really proud of TVS for upping the ante. Please anyone tell me shall I go this long with Ntorq125 ?? If yes what are the things I need to follow like need to give a break for 1hr once ? Or any other ? As always a detailed, to the point and informative review with good pics backing it up. Thanks a lot for this treat SunilG! Please Contribute -> Weekend Getaways for Mumbai Tourers !!! 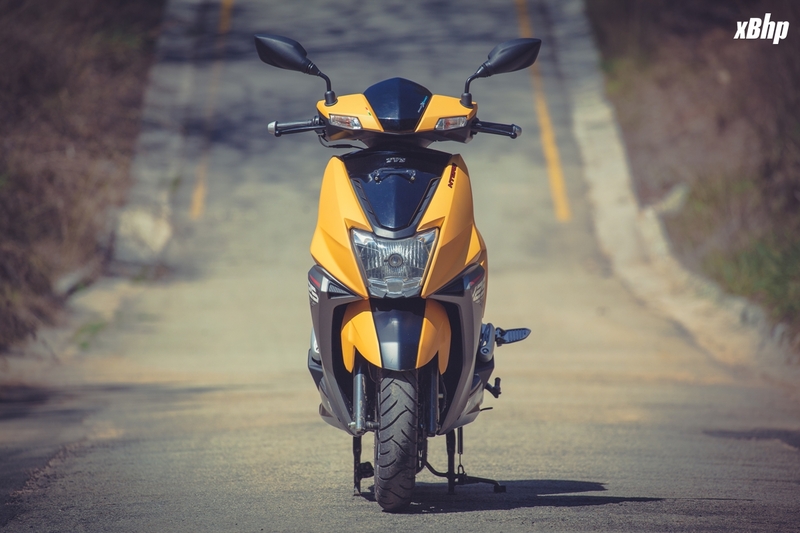 Any well maintained two-wheeler is capable of doing long trips (400 Kms or more) provided that you ride them within their limits and take some basic precautions like keeping a check on the fuel consumption. 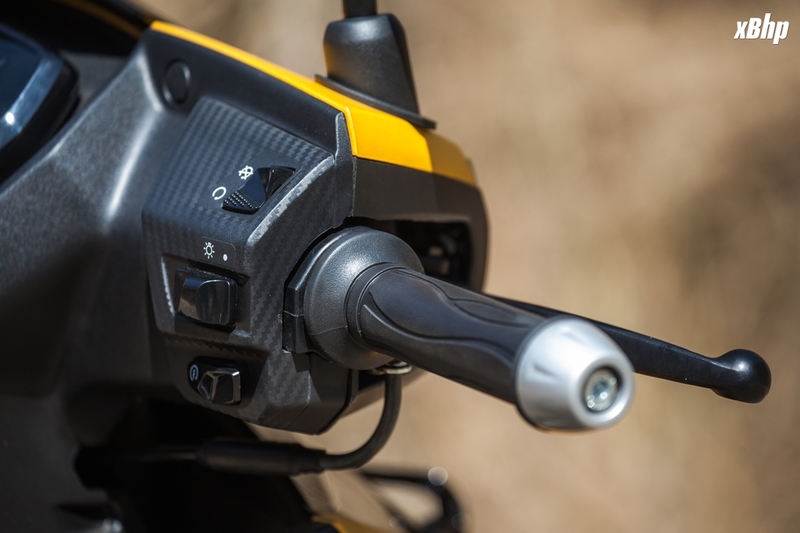 Guys in one of the pics above, showing the right side of the handle bar, I can see the headlight ON/OFF switch. I was under the impression that this switch is now missing in tow wheelers owing to the BS4 norms. My neighbors bought a Jupiter just a few months ago and there is no headlight ON/OFF switch on that as well. I thought that the switch was not provided so that owners cannot switch off the headlight even if they wanted to. Can you please shed some light on how TVS has managed to get this switch back?? I would like to thank my legs for supporting me, my arms for being always by my side and my fingers; I could always count on them. 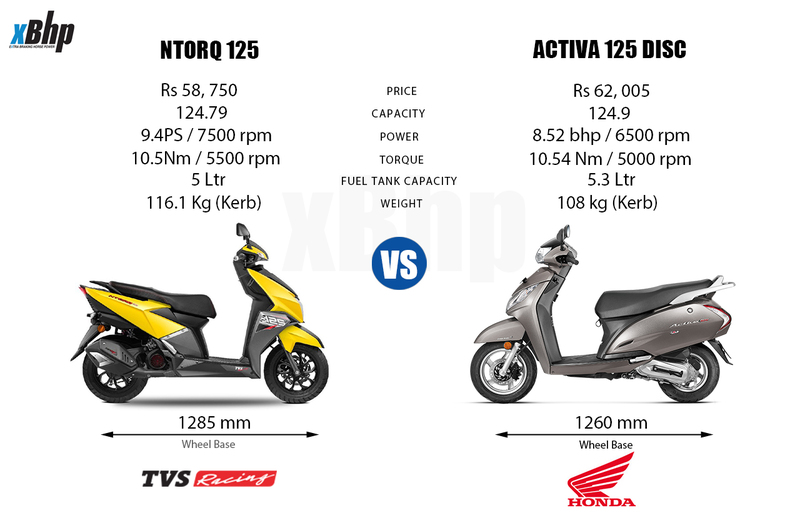 TVS NTORQ 125 Launched at 58,750 INR! Viaterra Fly GT Review: The 7000km Sun, Sand, Snow and Rain review!